With the success of immuno-oncology treatment strategies, there is an increasing need to investigate response – resistance mechanisms in order to optimize therapeutic regimens and develop combination strategies. Fluorescent multiplexed immunohistochemistry (fmIHC) enables translational researchers to characterize immune cell populations within patient tumor samples to further our biological understanding into response/resistance profiles. Many preanalytical factors affect staining quality of fmIHC, such as antibody - fluorophore pairing, antibody staining sequence, antibody stripping efficiency, and intrinsic tissue heterogeneity. Here we describe a standardized workflow for time efficient development and validation of immune-fluorescence multiplex biomarker panels on patient tumor samples. Serial sections of formalin fixed paraffin embedded human tumor TMAs were immunostained with a panel of six analytes (GITR, Lag3, FoxP3, CD155, CD8, cytokeratin) using Opal reagent and the BOND RX autostainer (Leica). Whole slide images were acquired with the Vectra/inForm imaging system (Perkin Elmer). Multispectral image tiles were stitched using a Matlab script. Halo software (Indica Labs) was used for analyte quantification and signal intensity measurement. Our workflow integrates pathologists’ gold-standard evaluation with image analysis to validate analyte expression in terms of specificity and reproducibility. This staining panel has been applied to an archival human pancreatic tumor cohort (n=46), with automated quantification of analytes compared to pathologist evaluation of singleplex chromogenic IHC performed on the same tissues to confirm reliability. Our workflow for developing multiplex panels to phenotype and quantitate immune cell populations is suitable for exploratory analysis of clinical tissue specimens. Yuan Sun received her Ph.D. from Hamamatsu University school of Medicine in Japan followed by a postdoc training in Stanford University School of Medical. 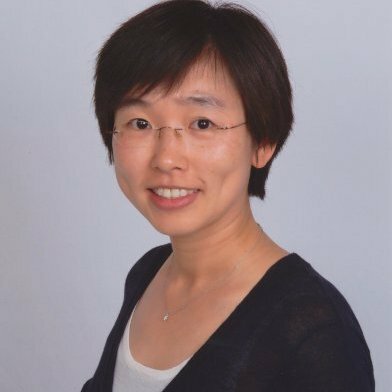 Currently, she is a senior scientist in the anatomic pathology group in Merck Research Laboratories in Palo Alto and leading multiplex immunohistochemistry assay development and validation.